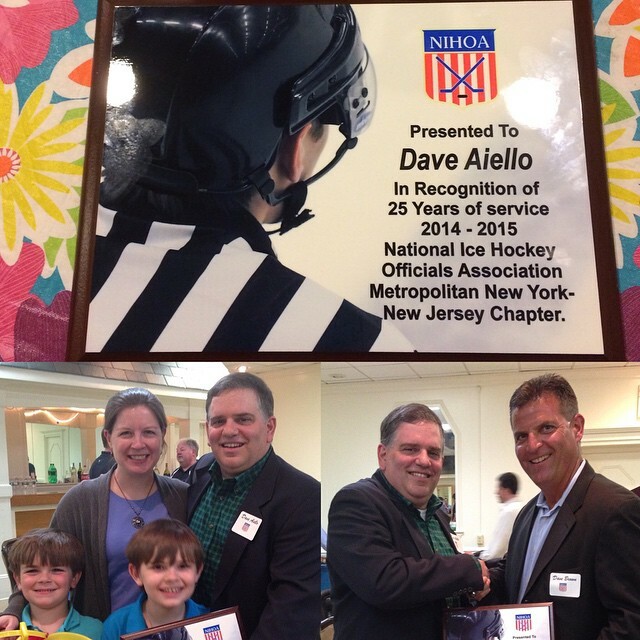 Yesterday I was honored to receive a service award from the Metropolitan New York-New Jersey Chapter of the National Ice Hockey Officials Association. I have been an on-ice official in this organization for 25 years. I joined the Metro NY Chapter of NIHOA in 1990, which was the autumn after I graduated from RPI. Back then I felt like I needed a way to stay involved in hockey, and officiating was the best way I knew to stay involved. I played hockey, soccer, and baseball for Chatham Township High School before I went to RPI, and so being able to officiate games at that level was giving something back to the NJSIAA, an organization with which I am proud to be associated. Kathleen and our sons Jimmy and Peter were able to attend the end-of-season banquet to see me receive this award. This is what made the banquet special for me. My sons are finally old enough to understand how much being a hockey official means to me. This is partly because Kathleen, Jimmy, and Peter all started playing organized hockey for the first time this year. Thanks to my fellow chapter members who have made me look good on the ice over the years.